Welcome to another edition of Other People’s Food (and Stuff…) Let’s get to it. Look at those waffles up there! 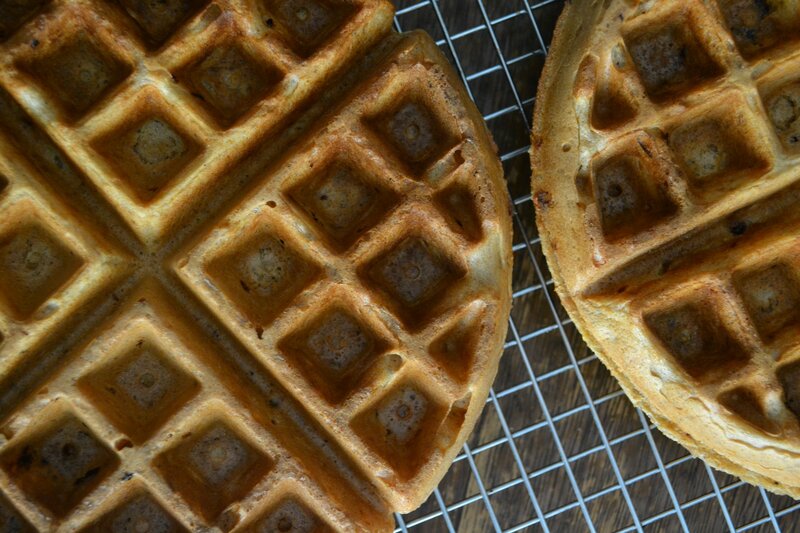 Those are Roasted Grapefruit Waffles from Keepin’ it Kind and they are spectacular! Such a surprising and inspired combination of flavors. Next up: the simplest dessert. Not long after I acquired my first ever bag of chia seeds, I went in search of chia pudding. The recipe that I used came from Food Doodles’ take on Chocolate Chia Seed Pudding and it’s satisfying, easy and so chocolatey. But since I can’t help myself when it comes to recipe tinkering, I made a second batch, the Mocha Chia Pudding pictured below, with some modifications. It’s a little extra work, but the flavor is a bit richer than the original version. It doesn’t get easier than this sugar-free dessert pudding. Melt the chocolate in a double boiler (or if you have a better longer span than I do, melt it in the microwave). Gently heat the non-dairy milk and the coffee and whisk into the melted chocolate. Remove from the heat, add the vanilla extract and let cool for a few minutes. In a small bowl, combine the chia seeds and stevia. Stir into the chocolate mixture. Leave the mixture out or store in the refrigerator until thickened. Add more milk if necessary. Top with cacao nibs. Apparently this has been buzzing around the Internet for years, but like Rip Van Winkle, I just kinda woke up to the whole phenom – thanks to a post at Terra, Not Terror. I was immediately intrigued by this idea, mainly because it sounds so freaking wacky, but also because I haven’t been satisfied with my face-washing routine in years. I was a Kiehl’s devotee for a long time, then kind of bounced around among various products, all of which made my face feel dry and tight. I’d then have to slather on copious amounts of moisturizer to counteract the dryness. As soon as I read the post, I bopped off into the Internet to read more. I got detailed info at The Oil Cleansing Method and set about making my own concoction. I had to mess with the ratio a little to get it right. I’m using a combination of caster oil (cheap!) and sunflower oil. I’ve been doing this routine now for a couple of weeks. And I’m a convert. I actually look forward to washing my face. It really is like a mini self-facial. My skin feels great, I’ve cut out the moisturizer (still use a daily SPF) and I think I’m seeing improvement in the texture and brightness of my skin. Weird, wild stuff! And then over at Air Eater there was a post about not washing one’s hair. I know, right? Lidia describes her new routine in detail and once again, I hit the Internet to find out more. There is a TON of info out there and yes, it’s old, old news. What has shampoo done for me lately except dry out my scalp?? I actually went cold turkey and am just rinsing my hair with plain old water. No one has yet turned away in utter disgust. The notion of letting my skin and hair – my own body – manage itself is truly appealing. 2018 update: I now use Deva Curl products exclusively and couldn’t be happier with my curls! I’m eternally grateful to Luminous Vegans for this post, which introduced me to the miracle that is Soapwalla Deodorant Cream. I read, I bought. It’s completely natural and contains no aluminum. It’s creamy, smells delicious (lavender, peppermint, tea tree oil) and is easy to apply. That’s all well and good, but it also needed to work. Without going into the ugly details, I put deodorant through its paces and this product came through with sweet-smelling colors. Get some for your wife/husband/friend/siblings. Get them off of the aluminum scary-stuff and onto this totally natural, effective cream. 2018 update: I no longer use deodorants on a daily basis (but this one smells divine and works well). I developed some kind of skin reaction so now I only apply it when it’s really, really hot and I’m going to be close to other humans. It’s fun sharing little info tidbits! Thanks for the hair washing info :-)! Doesn’t seem possible, right? Those little chia seeds are amazing ;-)! This post is the definition of eclectic! Interesting stuff all around. Hehe – I know! Probably shouldn’t have stuffed it all in together, but what the heck! I’m so glad you like the oil cleansing method. I love it too! I’ve had troubled skin forever and I finally feel like I’m doing something good for my face. I like it that you can make however much you want. My skin is dry during the winter, and really oily during the summer, so I’ll be able to change by the season. Thanks for the mention! Now… what do we do with all the bottles of cleanser and moisturizer? I want those bottles, but I can’t bring myself to dump the stuff down the drain! I know, Terra! I haven’t tossed anything yet, but… Isn’t it cool to not have to buy that stuff anymore?? I haven’t tried to make it yet because I have been crazy busy, but so intriguing. Tom’s and the crystal DID NOT work for me! As for the no poo (shampoo) movement – I’m terrified of it. Right now I’m using an organic shampoo with ingredients that are recognizable. Baby steps! Thanks for the deodorant link – interesting! Tom’s did nothing for me, either; never tried the crystals. As for the skin – one reason people have oily skin is that they wash off the oil that one’s skin produces naturally, so the skin doubles down and produces MORE oil to compensate. I was a combo skin type: oily/dry. Now…neither. It works! Radical. Need to do it then! I have been using up all my oils in my house making homemade soaps, lotions and potions. Need to post about that and some natural cleaning solutions soon. Yeah, it is kinda radical! I would love to read about homemade potions! Please share! I will do it, I have so many posts and so few days, I get Tuesdays and Saturdays on my shared blog. Sometimes it’s hard to cram it all in and my posts end up like crazy long diatribes! I think that natural recipes for home and body deserve a post of their own for sure though. That deodorant looks awesome! I make my own using coconut oil, baking soda, corn starch and various oils for scent. I tried going a few weeks without washing my hair, but then I caved. I’ll need to get back to the no-poo routine. I think if my hair were long, it would be a lot harder. But seriously – there’s not a lot of hair going on up there! That is the coolest that you make your own deodorant!! Is there anything coconut oil can’t do, by the way? Woohoo! I am so glad you liked the waffles! Thank you for the mention and the head’s up on all of these awesome tips! There’s so much in this post! It’s a veritable blogging feast. I have wondered about the hair thing but the trouble is I love the smell of my shampoos. I have quite a lot of hair and if I don’t wash it it looks greasy after a day or two (I wash it every day and I love the feeling of washing it). I’m curious about the deoderant cream, does it leave any residue? I stopped washing my hair over a year ago… the best thing I ever did – my hair is thicker, healthier, tangles less – plus I hated washing/drying my hair in the first place so it was a win in all respects! Ah! Thanks for the reinforcement! I’m not missing shampoo at all. I`ve been doing the oil cleansing method for a few months now and love it! Glad you do too 🙂 I use the same oils as you. I`m in love with it! Oh, cool, Gabby! Isn’t it kind of amazing? It seems so counter-intuitive, yet makes so much sense when you learn about it and start using it. Oh for sure! It’s so economical too- I still have the original mixture I made and it’s not even close to halfway done. I’m intrigued. I’ve gone to natural soaps and products as they are so much safer, but I’m not certain about the no-shampoo thing. What does your hair smell like now? Do you use hairspray? I’m afraid even my natural ones wouldn’t rinse out very nicely. I’ve used just water on my face all my life and I’ve had better skin than most people. I will pass this info on to my kids who have more trouble than I do. Hey there! Well, first of all, I have VERY short hair. I don’t use any products at all (I used to be big on gel, etc.). And my hair smells – honestly – like nothing. I’m kind of surprised, but really there is not discernible odor. Thanks for stopping by and commenting! Haha! Yeah, my husband didn’t notice ;-)! I think you are the last one in the Potluck blog circle so I need to send you a special button! Awesome post! I’d love to try some of these tips! Honestly Annie, you are one awesome woman, I don’t know how you do it! Hope you’ve had a fab week!! xo! Thank you for all these wonderful links, they’re definitely helpful-from food recipes to body products. I shall check them out. Thanks for letting me jump in late (have I mentioned that I do everything at the last possible minute?) and for the link to those grapefruit waffles!! Wow. Brunch cannot come soon enough! They are very, very good! Glad to have you in the Potluck, Emmy! Thank you thank you THANK YOU for the chia puddin’ recipe! I’m DYING to make some of this and it looks as if I don’t even need to go to the store for the ingredients!!!! Beautiful post as always, Ann!!!!! Rachel, it’s so good and so easy! And you can really mess with the flavors. A friend of mine just made a chai chia (hehe) pudding. It really works. I was prepared for it not to work – cuz all of the others I tried did not – but it’s wonderful stuff.